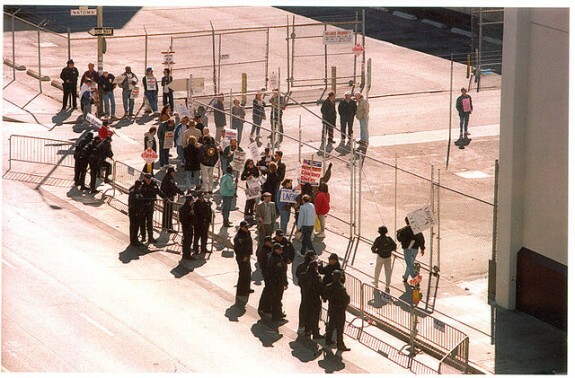 1994 pickets outside Chronicle building. Photo by Nancy Wong 1994. We mocked him for days, marching round and round, convincing ourselves without too much trouble of the essential moral failing and shallowness of the management position. Truth be known, a lot of us were just as clueless. There were, in fact, serious conflicts in the pressroom and distribution system, and the mailers (by this time we had figured out these were the people who assembled the papers and preprinted inserts into bundles for delivery) still had legitimate issues twenty-six years after the 1968 strike. We had been hearing about the Teamsters and Pressmen troubles and all that, and how the company was trying even to whack all the paperboys, who still threw the dailies from their bikes in those days. But who knew any actual details? For the Guild, the strike was all about solidarity and defending the idea that thugs and corporate guys weren’t gonna push us around. The impression that we were in a kind of comic book-superhero struggle, good-vs-evil, was reinforced by the arrival of the “notorious union-busting Tennessee law firm” King & Ballow, representing the company, and even more chillingly, a few days before the strike deadline on Halloween, the appearance of Huffmeister goons, imported from Detroit in riot gear. There’s still time to R.S.V.P. for Friday’s “Remembering the 1994 Strike” reception. We filed a labor board charge when the company tried to back out of joint bargaining, another sign they were up to no good, refusing to play by the rules. We got the board to agree that the company had to continue dealing with the unions all together on the economics, through the Conference of Newspaper Unions. We put out a CNU bulletin every week thumping the “bosses” and proclaiming the truth of our position. We were the good guys! We made a Western movie poster for Labor Day, featuring Linda Frediani, Susan Sward and Sally Lehrman, as our union “bad girl” gunslingers in black hats, which was a way of saying we were the good guys fighting the real bad guys. It was a lot of symbolism. The trouble with symbols, of course, is that they lack substance, and staying power. I knew from the start that we’d be in trouble if our strike dragged on very long. We could win a sprint but not a marathon. I was telling our negotiators I couldn’t be sure how long our picket lines would hold up. If I remember correctly, Doug Cuthbertson, chief negotiator for the Guild and the CNU, also thought the strike had to settle quickly or we’d risk doom. Less than a week into it, the rain was coming down in sheets day and night in one of the wettest Novembers since the Jurassic. I invested in a high-quality yellow rain coat and pants, and high plastic boots, from a camping supply store on Market Street. From the same store, on a whim, I bought a few hundred hand- or foot-warmer things used by hunters – you’d break the pouch and drop the thing into your boots, and some sort of chemical reaction turned it into a little heater for 20 minutes. I gave these out like Halloween candy on the picket lines. One night at Hanno’s, I brought a roll of red plastic tape, and asked a woman to help me tear off pieces to spell out “ON STRIKE” on the back of my raincoat in big letters. After that, I was a walking yellow picket sign. The cockeyed red lettering looked like something Johnny Rotten might have worn. I recall being summoned to an important meeting at the strike headquarters, organized by a few of the more prominent newsroom members. They had started wondering what the strike was about. I told them it was about “solidarity” but they weren’t so sure. Some Examiner staffers suspected a setup by the morning paper staff, which the Examiner patriots reckoned were dominating their union. They thought we were using the strike as a means to kill the Ex, which came out in the afternoons and was definitely shaky in terms of finances and circulation. Some of us would go out every day and gather up any scab papers we could find, pulling them off store shelves and out of the racks, even now and then out of people’s hands if anybody dared to be seen reading a scab Chronicle or Examiner on a street waiting for the Muni. I was probably leaning into the wrong breeze there. Larry Hatfield, the Ex rewrite man, a big wheel in the Guild national organization at that time, grabbed me by the collar of the raincoat and forced me out of the room before I could do any serious damage. He ordered me to go home and take a nap. It just kept on raining, and we kept on striking, into our second week. This clipping is from the San Jose Mercury News dated November 3, 1994. 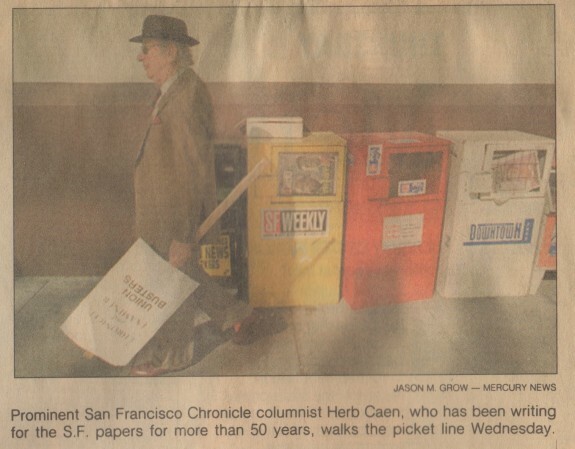 It shows San Francisco Chronicle columnist Herb Caen walking the picket line near 5th and Mission in San Francisco during the newspaper strike of 1994. Photo by Jason M. Grow – Mercury News. The death, one rainy night, of Kent Wilson, a Teamster, apparently electrocuted during an attempt to cut power to a scab location on the Peninsula, showed how serious some people were. This was surreal to a lot of us in the Guild. We weren’t expecting anything of the kind. One night Bill Wallace, who was president of the Guild local at that time, gave a speech on Mission Street to a sea of strikers and TV cameras. I encouraged him to call a moment of silence for Brother Wilson. As the crowd fell into a stunned quiet, the TV lights lit up the scene, the streets all wet and so were people’s faces, from the rain and the tears. It was the most powerful few seconds of the whole ordeal, for me, and I still can’t say exactly what it meant. Kent Wilson paid way too high a price. We all want his family to know we will never forget his commitment to his colleagues and to the union. In the Guild, the stakes seemed lower, and tactics obviously tamer. 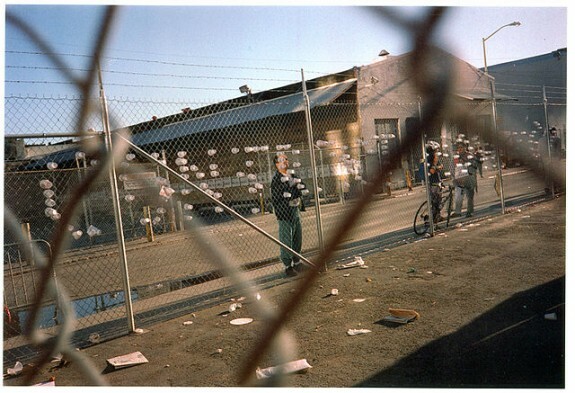 We put out the strike paper and played around with the new thing called “the Internet.” We walked around buildings, milled around the strike headquarters, yelled at the scabs going in and out all day in vans with plywood covering up the windows. Some of us would go out every day and gather up any scab papers we could find, pulling them off store shelves and out of the racks, even now and then out of people’s hands if anybody dared to be seen reading a scab Chronicle or Examiner on a street waiting for the Muni. Then we’d haul the papers back to the strike headquarters around the corner from the union offices on Natoma, and dump them out front. Gray soggy newsprint started melting together into an undifferentiated mound, growing like a giant piece of moldy cheese as the strike went on. Ken Howe, a business writer who later went into the management, and still later moved to Hong Kong, was particularly good at feeding the newsprint pile. Very few scab papers escaped our cleanup crews. We told the police we were picking up trash to beautify the city. They gave us no trouble. Herb Caen and the other columnists, every last one of them as I recall, were solid for the striking unions, and may have been our single greatest contribution to the ultimate victory of a return to work after only 11 days out. Mayor Frank Jordan was a great help, although you’d have to ask someone else what exactly happened at City Hall to settle the strike. For me, it was all in the streets. I was listening at the time to a lot of Michelle Shocked, who put out a record called “Short Sharp Shocked.” I thought those three words pretty well summed up that whole strike for me. There were some special moments. 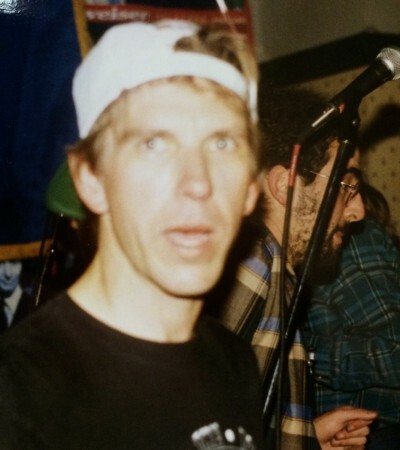 On the night of the November 1994 election, for instance, I remember getting an urgent call to come down to strike headquarters, because the crew putting out the SF Free Press, our strike paper, was having a problem with the Macintosh computers or something. They were trying to put out the Election Special. I got down there and it appeared the computers were frozen, and nobody had done a “Save” for quite some time. Tyra Mead was not too happy. Somebody else got upset with me when I read her San Francisco election story and voiced a criticism about insufficient coverage to the pro-union candidate who had lost the race for supervisor. We wound up losing the whole edition and had to start over from scratch. After a couple hours, I remember we ended up with a very modest little publication that still had more news in it than the morning Chronicle, since we had actual reporters and they didn’t. I took a bunch of the papers up to the Castro and handed them out to the commuters at sunrise. Actually, the sun didn’t rise because it was raining, I think, but I remember taking the train back downtown, to Powell Street, and when I came up, the entire street, from Market to the Chronicle-Examiner main building at Fifth and Mission, was jammed with people yelling and chanting. It was a combination of the strikers and people upset about passage of an anti-affirmative action initiative that year. We had all the students and people of color on our side. That’s a speech, but what the hell. We sometimes have to give a speech. Carl Hall, a couple of decades ago, warms up for Solidarity Forever. Photo courtesy the subject. One last thing. The food for us strikers in 1994 was outstanding. I remember eating a lot of delicious stuff and usually had no idea what it was, since my plate often would be floating in rainwater while I was eating. Greens Restaurant at Fort Mason, where my friend worked as a waiter, was a generous donor, but I think the food writers must have made it clear to every decent place in town that they’d better pony up, and no second-rate fare would be acceptable. Somebody managed to get some big insulated containers that allowed us to deliver delicious hot restaurant meals to the Army Street and Richmond production centers. I heard later some people in the more remote locations never got fed, and I felt bad about that. I think I gained quite a few pounds. The veggie chili was terrific. And yes, there were Port-a-potties. Carl Hall is now Executive Officer of Pacific Media Workers Guild, having retired from the San Francisco Chronicle in 2009 where he was last a science writer. You can now find Hall marching in the back alleys of the Chronicle building or at the latest third wave coffee shop. He hopes you’ll come to the anniversary party at the Guild. Details here. Looking forward to seeing our special guests tonight!